Picture by Charlie Perez and used with permission under Creative Commons. Entonces, discúlpenme si soy tan… digamos, negativo. Pero quisiera un país como el que soñaron Maldonado, Espejo, García Moreno. No este puñado de vulgaridades y peleas intestinas. Un país católico, un país de hermanos. So excuse me if I am so … let's say, negative. But I want a country like that dreamed of by Maldonado, Espejo, García Moreno. Not this handful of vulgarities and intestinal fights . A Catholic country, a country of brotherhood . Esta Asamblea ahora redacta leyes, como la anteriormente expuesta, y se apresta a redactar otras, que inevitablemente surgirán de un proceso viciado que tarde o temprano podrá anular lo actuado, ya que son leyes emitidas sin estudio previo a su efecto en la sociedad, generando más caos y profundizando el limbo jurídico en el que ahora se desenvuelve nuestra patria. This Assembly is now drafting laws, as set forth herein, and is preparing to write another, which inevitably arise from a flawed process that sooner or later may cancel the proceedings, because these laws are issued without prior study of its effect on the society, generating more chaos and deepening the legal limbo in which it operates right now our home country. …No olvide ir a la marcha socialcristiana en la que empieza la lucha contra la autonomía (la otra marcha fue finalmente usada para otros fines, y no se sorprenda si esta también) favor llevar banderas grandes para que en las fotos aéreas no se vea vacía la calle. …Do not forget to go to the Social Christian march, which begins the fight against autonomy (the other march was eventually used for other purposes, and don't be surprised if this will be, as well) Please, carry large flags for the aerial pictures so that the streets do not look empty. Muchos que estuvieron tampoco están de acuerdo con las fundaciones oscuras. Un tanto más no les cae bien Nebot, pero peor les cae Correa. Sea cual fuere la convicción, el hecho es que hay que notar que todavía el presidente, y sobre todo, su carácter y comportamiento, genera rechazo. Many of who were at the march were not in agreement with the dark forces. Even if they do not like Nebot, they like Correa even less. So whatever their beliefs, the fact remains is that it must be noted that even the President, and above all his character and behavior generates rejection. No soy anticorreista consumada, de hecho, considero que el gobierno ha tomado algunas medidas correctas. Tampoco soy pro Social Cristiana (¿existe todavía ese partido?). Sin embargo, estuve ayer en la marcha de apoyo a Nebot y de oposición a Correa. ¿Por qué? Porque me ofrecieron un puesto en el Municipio. Totalmente falso, fui porque quise ir, sin ninguna presión de ninguna clase, solo la de mi indignación. 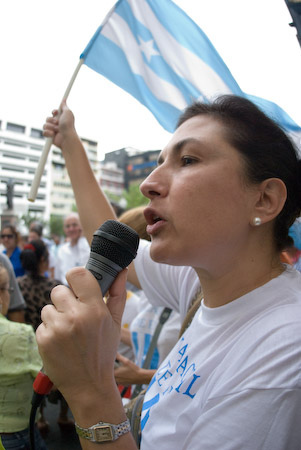 I am not consummately Anti-Correa, in fact, I believe that the government has taken some correct steps . Nor am for the Social Cristians (Does that party still exist?). However, I was at the march yesterday in support of Nebot and in opposition to Correa. Why? Because I was offered a job in the municipality. Totally fake. I went because I wanted to, not press at all, the only press was my anger. Y hablando de panzones con aires de grandeza ¿no les cabrea la “medición de fuerzas” entre Nebot y Correa?. A la mayoría sí, nos cabrea, pero también hay harta, hartísima gente (de acuerdo a las multitudinarias marchas de lado y lado) que apoya a uno o al otro. And speaking of fat cats with their arrogance: Don't you get angry with “the testing of might” between Nebot and Correa? The majority yes, we're angry, but there are also too, a lot of people (according to the countless demonstrations side-by-side), which supports one or the other. Nosotros, tan acostumbrados a creernos superiores, seguramente pensamos que nuestros ex-abruptos corresponden a las finezas verbales de los lores ingleses, que discuten en el Parlamento en medio de risas y hábil manejo retórico en forma de punteo-contrapunteo verbal. Pues no, lo siento: NO somos así. Lo nuestro es más brutal, más ciego, más autoritario, más vulgar e ignorante. Y eso es un problema que los líderes hacen cada día mayor. We are so used to think of ourselves as superiors, certainly we think that our behaviour corresponds to the finest of England's Lords, who discuss in Parliament amid laughter and skillful management in the form of rhetorical verbal pointing and counterpointing. Well, no, I am sorry: we are NOT like thatl. Ours is more brutal, more blind, more authoritarian, more vulgar and ignorant. And this is a problem that the leaders become worse and worse. Just to clarify one thing, when you quote Fatima Ifigenia, you stop in the part when she “admits” that she went to the march because she was offered a job in the municipality. This quote is taken out of context, and if you read her whole entry it is an inside joke. The mayor had won the hearts of the Guayaquileños (People who lives in Guayaquil) not only for their good administration but also for the love that he puts on rebuilding the whole city, All the Guayaquileños were witness on how this man works, and not only did and continued doing what he is supposed to but also he exceed the expectancy of the Ecuadoreans, So this MAYOR had become a national leader on the past few years, his administration had received so many awards from all over the place. The problem is that the new government Mr. Correa instead of helping him developing more areas and work together as a team he wants to take away the resources that the Mayor has, and had become a political issue; because after all that’s why the people who elected him vote for, not for stablishing arguements but to work together, well this is not happening. On the past the government never did anything to help the well living of its people they took their money and vanished, now everything had change because of Mayor of Guayaquil is returning 90% of their money back to its people on services, transportation, health, books, new schools everything so that’s why people are very happy with him and will follow his lead until the last consequence. Thanks Andrew, you have a proper observation. I’ve tried to corrected. Gracias Guayaquil por hablar y defender a nuestra Patria. What President Correa is doing is only polarizing a country in much need of unity. I only hope the rest of the country and more importantly the military forces put a stop Correa’s madness misdirected and misguided by another “loco” Chavez!